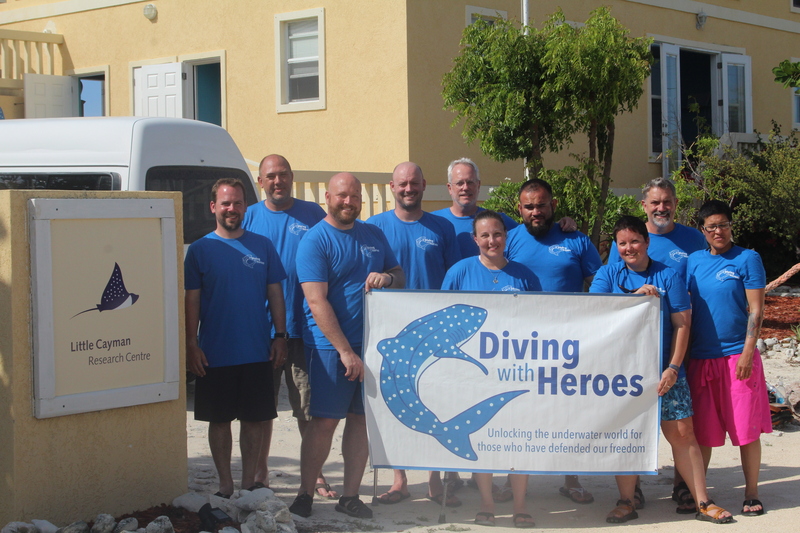 Blossom Village, Little Cayman – Diving with Heroes, a Haymarket, Virginia, based nonprofit, funded six injured U.S. military veterans and four volunteer divers to travel to the Cayman Islands to add their military background-honed skills to support on-going coral reef research efforts. The Diving with Heroes group, from left, hero diver Aaron Kirzner, hero diver Rob Howland, volunteer diver Matt Staton, hero diver Ken Shere, volunteer diver Scott Vadnais, hero diver Brenda Hawkes, hero diver Sergio Trejo, volunteer diver Jill Hottel, volunteer diver Joe Brickey and hero diver Dani Figueroa, at the Central Caribbean Marine Institute’s facility on Little Cayman Island. Diving with Heroes works with veterans and service members of the U.S. armed forces who have been injured during their service to the nation. These heroes have been certified to dive as a means of physical, emotional and/or social rehabilitation. The group came into existence in 2014 to ensure that the heroes’ rehabilitation and recreation did not end with certification but is instead carried over into their everyday lives. Hosted by the Central Caribbean Marine Institute, the DWH group participated in two dives to clean the underwater coral reef nursery, two lionfish culling dives, and one lionfish census dive. The group helped two University of Florida researchers, Steve Whalan and Paul Maneval, in building two different types of underwater framework for growing new coral. One type, called a “tree,” is made from PVC pipe, and the other is a modified “dome” made of rebar. The DWH team cut, drilled and applied their military expertise to making each project just a little bit better. 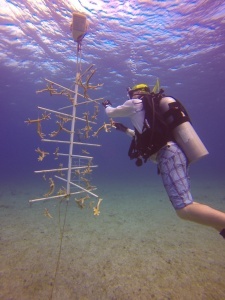 Hero diver Ken Shere works at cleaning the underwater coral nursery at Caribbean Central Marine Institute, Little Cayman Island. 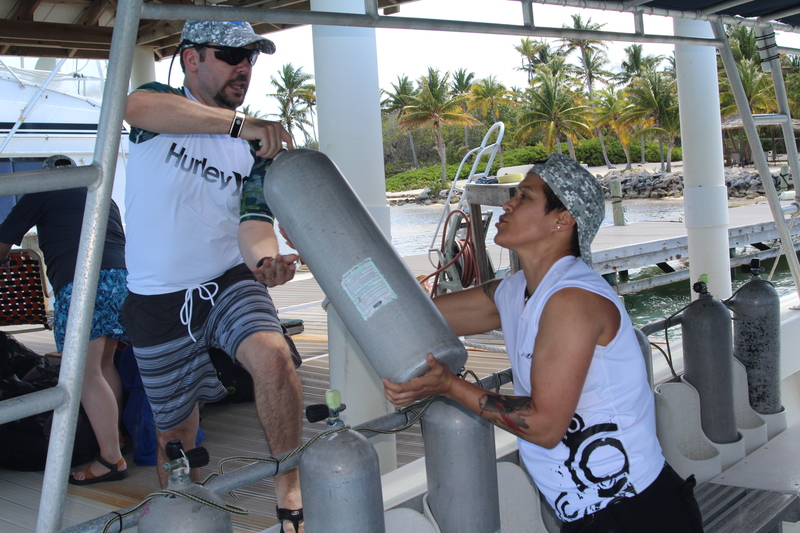 Three other hero divers, Brenda, Ken and Rob, assisted Steve in building a jig where the PVC pipes can be quickly and efficiently drilled. The Diving with Heroes group also assisted the researchers in cleaning the underwater nursery. Many wounded or injured veterans, besides suffering their injuries, often feel rudderless after being evacuated from their unit. They no longer have a battle buddy (you watch over them as they watch over you, each making sure the other has all the proper gear for whatever situation they may find themselves) and they no longer are part of group with an overarching mission. This DWH excursion attempts to replicate both. Diving with Heroes is a 501(c)(3) charitable organization whose mission is to unlock the underwater world for those who defended our freedoms.